See the changelog for changes and roadmap and try thenightly build for the latest and greatest. 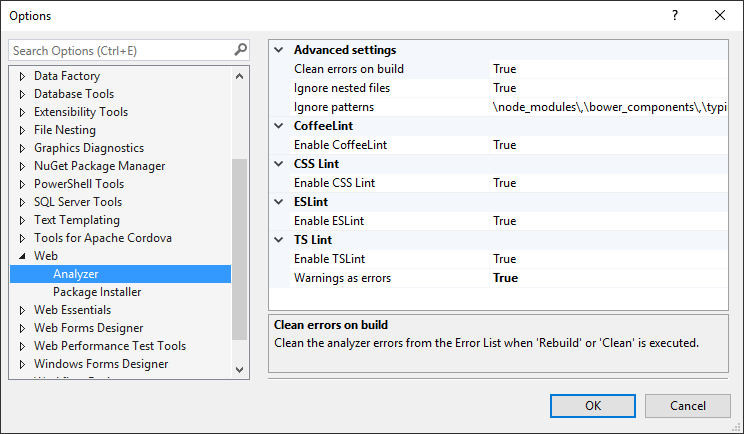 When an error is found it will show up in the Error List in Visual Studio as either an error or a warning. The individual rules for each linter can be configured to be either an error or a warning. Double-clicking an error will open the file and place the cursor at the location of the error. The linters automatically run when you open a supported file. That makes it easy to see if there are any errors. When saving the file the linter runs again. You can manually run the linters on a single file, multiple files, folders or the entire project by right-clicking in Solution Explorer. It's also from the same context menu you can clear all the errors generated by Web Linters. Each linter has their own configuration file. For instance, ESLint uses a JSON file with the name of.eslintrc to store the configuration in. The configuration files are located in your user profile. Example: C:\Users\myname\. If the configuration files have gotten messed up, you can reset them to their defaults by clicking theReset Configuration Files command. It will prompt to ask if you are sure you want to proceed and, if you click yes, all the configuration files will be restored to their defaults. You can override the global per-user configuration of each linter on a folder, project or solution level. Simply copy in each config files (such as.eslintrc or tslint.json) from the user profile folder and into the root of the project or solution. You decide which linters to run by enabling or disabling them under Tools -> Options. They are all enabled by default. You can reset the settings under Tools -> Web Analyzer. If you haven't made any modifications to any settings or configuration files, then it can be a good idea to reset the settings after updating the extension. Typically newer versions of the Web Analyzer extension will have updated configuration files with better defaults.